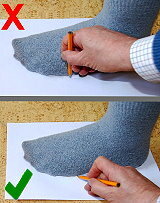 Do not use a marker pen and keep tip close to the foot. Hold the pen in a writing position and not up straight up as this can add extra width to your template. The size calculated may differ slightly from your regular shoe size. It also depends on the accuracy of your measurements. 3. The feet length shown on the right is standard for your size. 4. The width shown on the right is standard for your size. Please adjust these to your measurement. 5. Compare your outline to these shapes and click on that is nearest to your foot shape to calculate your size. Please click on the image below that best describes your foot shape to continue. Although it should not be neccesary, if for peace of mind you wish to have your template verified for instructions Click Here. Not sure or having problems with your measurements? Click below for a free call!